Private (1-2 students) and Semi-private (3-6 students) lessons are available by appointment. Make your wedding dance a memorable experience. 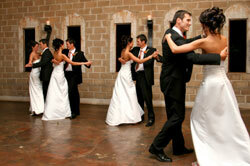 Find out how our customized dance choreography and coaching can help you enjoy your 1st dance as newly-weds. A wedding dance choreographed just for you: a perfect complement to your special day. Ask us about our very popular wedding dance package, which may include a fun group lesson or two for your wedding party. Wedding Dance Packages from $295. For unique gift ideas, why not consider the gift of dance? Gift certificates from Ballroom Dancing with Ivy make your gifting easy. Available in any denomination, they can be applied to Group Lessons, Private Lessons or Wedding Dance Packages.